Jack and Emma Minteer of Rose Hill Ranch, Naples, NY are well known for their colt starting and foundation training with young or difficult to work with horses. The couple starts horses for all disciplines, working together with the horses and owners. In addition, the Minteer’s are also involved with the Extreme Mustang Makeover, a 100 day training competition with wild horses. After a bull riding career of over thirty years, Jack is now president of the New York Reined Cow Horse Association, competing in the event as well. He is a second generation trainer who uses some of the same training principles as his father, Dave Minteer. He and his family represent over one hundred years of training experience. Emma’s passion for horses started at an early age and by the time she was fifteen, she was already starting her own colts. She became involved with the Extreme Mustang Makeover in 2012 and hasn’t looked back. She has competed in five makeovers, placing reserve champion in her most recent one and the top ten in every other event. The video shown below tells the story of Emma's first Mustang makeover, and how she gained that wild mustang's trust, using only photographs and a song by Rascal Flatts. It is surely one of the most beautiful stories ever told. Then read Emma's article below. With approximately 100 days to tame wild to mild, trainers from across America continue to take the challenge of competing with an American Mustang at Extreme Mustang Makeover events across the United States. Trainers compete for cash and prizes while displaying the trainability of American Mustangs in hope of finding a suitable adopter. The Mustang Heritage Foundation created the Extreme Mustang Makeover event in order to recognize and highlight the value of Mustangs through a national training competition. These events give the public a unique opportunity to see the results of wild horses becoming trained mounts. The purpose is to showcase the beauty, versatility and trainability of the rugged horses that are housed at Bureau of Land Management facilities. After being selected to compete at an Extreme Mustang Makeover event, a trainer picks up an American Mustang that has been virtually untouched by humans. With approximately 100 days to gentle, halter break and saddle train the Mustang before the competition, trainers must build trust and develop a relationship with the horse to ensure the best performance. I had always loved Mustangs; even as a kid, I was intrigued by them. I even did a 4-H public presentation on wild horses. So when I was flipping through a Western Horseman magazine one early spring day in 2012 and saw that the Extreme Mustang Makeover was coming to NJ that August, I knew this was for me. The Extreme Mustang Makeover, (EMM), is an approximate 100 day training challenge with selected trainers (you have to send in an application to be selected) and a completely wild horse. The EMM was created in 2007 by the Mustang Heritage Foundation, (MHF), a 501 ( c )(3) public, charitable, nonprofit organization dedicated to facilitating successful adoptions for America’s excess Mustangs and Burros. So I sent in my application and very anxiously waited to hear back. When I finally received the news that I was selected, I was so excited. My childhood dream of working with a wild horse was really going to happen! ​ Picking up Chinks at the Lorton, VA pickup area. The Mustang Heritage Foundation mission is to increase adoption of wild horses held in the Bureau of Land Management’s corrals and long term holding facilities. The BLM is currently responsible for more than 50,000 horses in short term and long term care. The Mustang Heritage Foundation works to promote the Mustang’s versatility, trainability, and worth as an equine companion through innovative and exciting gentling programs and competitions including Extreme Mustang Makeovers, Mustang Million, Youth and Yearling Mustang Challenges, Youth “Camp Wildfire,” and the Trainer Incentive Program. Over 5,000 American Mustangs have been adopted through the Mustang Heritage Foundation since 2007. Fast forward to May 12th, 2012. It was pickup day for the NJ EMM. I honestly had no idea what I was getting into. All I knew was that I was going to take a wild horse and gentle it…in 100 days, and then compete with it against nearly 30 other trainers, who had been doing this a lot longer than I, and then it would be available for adoption. 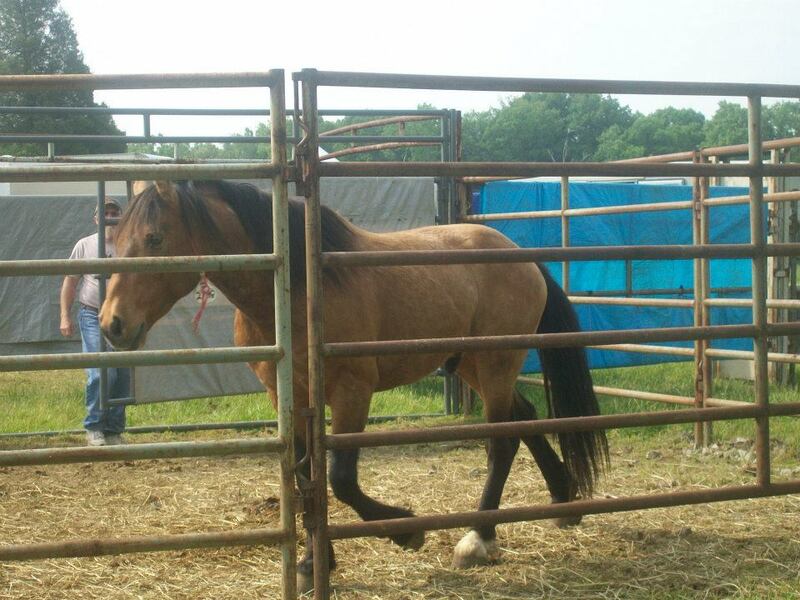 When we arrived at the pickup location in Lorton, VA, the very first horse we (my husband Jack and I) saw was a little dun gelding in a pen all by himself. I said to Jack, “Man that would be so cool if that was my horse!” (Horses are selected for the trainer, they do not get to pick their horses!). Little did I know, that WAS my horse! He was beautiful. He had a gorgeous black tail with thick mane. His eyes were a marble brown and he was missing the top half of his right ear, which we believe was due to frostbite. So we backed our trailer up to the chute to get him loaded. I had the option of getting a halter put on, but I decided that would be one more possibly negative experience that he really didn’t need to have. Besides, I wanted to be the one to put a halter on, when he trusted me enough to let me do that. When we finally got home, the training began. I had a round pen set up for his training/turnout. Within just a couple of days, I was able to very slowly approach him on his right side and gently touch him. I couldn’t get anywhere near his left side without him taking off across the pen. This went on for days and I felt like I was getting nowhere. I could get him to move his feet in different directions, but I couldn’t get his feet to hold still. So I had to get creative. I made his pen a little smaller (roughly 20x20) and took a long pole and laid it across his back and kept it there until he stopped moving his feet. As soon as he relaxed with this strange, horse eating machine touching him, I took it away. I repeated this process over and over until I got him to the point where I could actually touch him all over with my hands. It took me 12 days just to get a halter on him! Throughout this whole process, never once did he try to hurt me or even threaten to hurt me. I was prepared for a horse that was going to charge me, kick at me, try to bite or strike me, but he never offered to do any of that. He was just plain scared. We have since had other mustangs who have acted like described above, but they have never done it out of aggression; it is all out of fear. They are prey animals. It is fight or flight. They are used to running in the wild and getting away from something that scares them, but when in an enclosed pen, they can’t go anywhere. (Well, they could try jumping out of their pens, which we have seen/had them do!) We have also had mustangs where literally within minutes of stepping into the pen with them, we are brushing them, haltering them, touching them all over, etc. It really depends on their personalities. Some are so gentle and want loving attention, where others make you have to earn their trust before they will allow us to handle them. After getting the halter on him, I had his trust. Well, some of it anyways. He was still hard to catch sometimes, but our training and trust really progressed from there. By the end of my third week with him, I was putting his first few rides on him. I never did anything that pushed him beyond what he was ready to do. I had to listen to him and back off when I could see he wasn’t ready for something. I was constantly checking in with other more knowledgeable trainers to make sure I was doing everything right. the ​BLM. The brand is unique to each individual horse. If you have questions for Emma Minteer, or would like to suggest topics for this page, ask away! SHAKALAKA BOOM BOOM and her adoptor, Lois Hacker took 5th place in their first ever dressage show! Shakalaka Boom Boom was an Extreme Mustang Makeover wild mustang that was trained by Emma Minteer and auctioned off at the end of the competition to lucky bidder Lois Hacker. Proud of your special mustang, mule or donkey and want to share your photos and stories with us? We would love to have them! Go to our CONTACT page and email them to us!